Today’s entertainment and media consumers expect an increasingly intuitive, fully personalised digital experience. In order to keep up, savvy media and publishing companies aren’t asking whether or not they need to transform. They’re figuring out how to gain better control of their brand’s digital assets, and how to use analytics and insight to drive the most effective prospective and converted customer journeys. Find out what consumers in the UK think about customer experiences, and how closely marketers’ perceptions align with them. 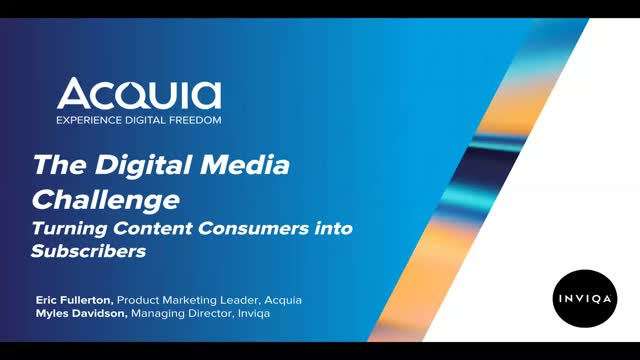 This webinar, hosted by Acquia, Marketing Week and Regina Corso Consulting discusses the results of a global survey among consumers and marketers, looking into how much those in the UK agree or disagree on customer experiences – and how that compares to worldwide trends. We focus on the expectations that consumers have with regard to these experiences, if marketers feel the same way and if reality supports these expectations. Personalization is top of mind for many organizations – 67 percent of marketers are pursuing personalization today. And although personalization is critical to engaging audiences in an increasingly competitive digital landscape, it’s challenging for organizations to understand where exactly to start. In the first portion of this webinar, SiriusDecisions will share its industry and market insight to highlight the value personalization can deliver to your business based on their years of expertise in the B2B space. Next, you’ll hear about Acquia’s multi-step approach to enabling data-driven personalization at your organization, with a specific focus on customers who have just started down the path to personalization. In this digital-first world, organisations must be customer-first. No matter the brand or enterprise, the new rules require you to engage individuals and deliver personalised experiences at every point in the customer journey. The complexity is only growing as CMOs, customer experience (CX) pros and tech leaders grapple with digital sprawl – wrestling with greater marketing demands, higher customer expectations, and rising complexity across martech, data and touchpoints. Join this webinar to learn more about achieving global marketing excellence with a digital factory. Personalisation requires technology, people, data, and strategy. Learn the steps you can take and technology you can leverage to deliver data-driven experiences to your customer, no matter where you are in your digital journey. Explore what digital transformation and an innovative digital experience platform can do for your business. You’ll learn how organisations, such as Nestle, the BBC, and The Grammys are creating and delivering successful customer experiences, and how you can follow suit to get to market faster. - How to combine digital activity and strong leadership to drive transformation. - The key touch points in customer journey mapping and planning to gain real business impact. - How to build, manage and optimise digital experiences to create customer moments that matter. - How to transform your IT digital team from a “bottleneck” to a trusted service provider. - How to implement a site-governance strategy across your organization. - Best practices for expediting website development and delivery. We provide the world’s most ambitious brands with technology that allows them to embrace innovation and create customer moments that matter. At Acquia, we believe in the power of community — giving our customers the freedom to build tomorrow on their terms. Acquia is helping some of the world’s leading brands succeed, including Twitter, Mercedes Benz, Warner Music Group, and the BBC. More than 4,000 organizations are using Acquia’s solutions for content, community and commerce.